Weston County also had its share of colorful characters. The Gambling Sheriff, Johnny Owens, once owned the famous Hog Ranch. In Newcastle, he owned the saloon and dance hall. The saloon was known as the “House of Blazes” because of the nightly gunfire. Diamond “L” Slim Clifton was hung by the railroad tracks in Newcastle in 1903 for the murder of a young ranch couple. The former home of U.S. Marshal Joe Lefors, who chased Butch Cassidy and the Sundance Kid out of this country all the way to South America, is still standing at 28 E. Winthrop Street. Near Four Corners, the only successful robbery of the famous treasure coaches took place. Missing gold from the Canyon Springs stage robbery is still hunted today. Much of the area history has been preserved in the Anna Miller Museum. Sagebrush, which grows like a weed in Wyoming is a “local treasure” in Weston County thanks to a proclamation signed a few years ago by Newcastle’s mayor and the county commission. Today Newcastle is one of the country’s finest sources of the most pure, crystal clear, artesian water. The best display of this artesian water are the ponds and fountain of the Fountain Motor Inn. Located at the junction of U.S. Highways 16 and 85, Newcastle is nearly equal distance from Mt. Rushmore, Devil’s Tower, the Mammoth Site, the Black Hills Passion Play, Deadwood’s gaming halls, Jewel Cave National Monument and a host of other attractions. Some of the most exciting National Monuments, Memorials and attractions are only an hour or less away! Anna Miller Museum: Named for Newcastle’s first librarian and built in the 1930’s as a WPA project for the Wyoming National Guard. The museum complex includes the Green Mountain Schoolhouse, the Jenney Stockade Cabin and many artifacts from the old Cambria Coal Camp. Also featured is a display of dinosaur fossils. Weston County Fairgrounds: Location of an annual High School Rodeo and a Professional Rodeo in May, the world famous Perino Horse Sale the first Saturday in June and Weston County Fair & Rodeo in August. Big Game Hunting – Begins just outside of town! Four Corners: Located north of Newcastle on the western edge of the Black Hills and along the Cheyenne to Deadwood Stage Route. The Vore Buffalo Jump: One of the world’s premier archaeological sites where up to 20,000 bison were trapped by Plains Indians. Located at the edge of the northern Black Hills just east of Sundance. Paleo Park: You can dig for dinosaur bones and fossils on this authentic Wyoming ranch as well as see antelope, deer, many types of birds, native flowers and grasses. Open June, July and August. Located 24 miles southwest of Newcastle in Niobrara County. 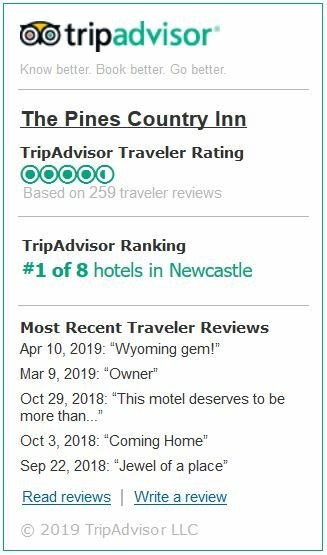 Make The Pines Country Inn in Newcastle your home base for exploring the wonders of the Black Hills!